Before- What do I need to do to prepare for a peel? Avoid shaving, waxing, bleaching hairs, hair removal creams and laser hair removal for at least three days before the procedure. Do not do any exfoliating scrubs or other exfoliating lotions with retinol or alpha-hydroxy acids, unless you have been given directions to do so by your esthetician. Do not have facial fillers or Botox for two weeks before the peel. During- What can I expect during my peel? First, your esthetician will gently cleanse your skin. Then, she will apply the treatment (usually a liquid) with a small brush. The chemical is then left on the skin for several minutes, depending on what your esthetician has determined is best for your type of skin. Using water to neutralize the chemical, your esthetician will then wipe off the treatment. You may feel a little tingling or burning with the treatment is on your skin. A small fan can help cool the skin and relieve any discomfort. After- What should I do after my peel? Superficial peels may cause mild redness, slight swelling, mild tingling or stinging (relieved by cold water) and mild flaking. These usually resolve within 48 hours. Use cold water compresses to keep the area cool as needed. Avoid hot water and heavy exercise in the first 24 to 48 hours. Moisturize the skin and protect it from the sun. Apply sun block every four hours if you are outside a lot. Avoid picking or scrubbing the skin as this slows the healing and can cause scarring. Use skin care products as advised by your esthetician. How soon can I see the benefits of the peel? Some improvement in your skin’s condition can usually be observed from a few days after. A series of treatments several weeks apart is usually recommended to obtain the desired result. 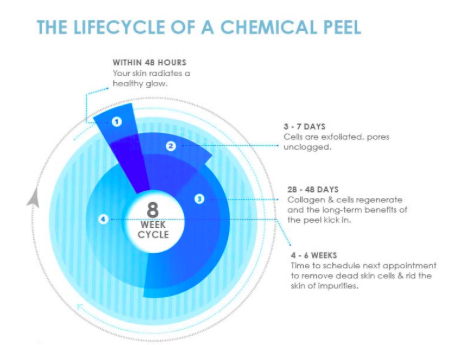 Most people experience significant improvement after four to six chemical peels. This varies with the individual and the condition being treated.